James Tilson and Robert E. Prasch follow the money at New Economic Perspectives regarding the AIG bailout and a more accurate sense of costs. Among the shares the Treasury sold were 562,868,096 gifted to them from the Credit Facility Trust. This trust had previously been established by thehtFederal Reserve Bank of New York for the sole benefit of the Treasury Department. When these shares are taken into account, only 65.99% of the total returns from the Treasury’s sale of AIG common stock can be attributed to its original TARP investment, and the remainder should be credited to the FRBNY. The Treasury’s calculation, however, does not adjust for this transfer of shares. The effect is to artificially boost the returns on its politically contentious TARP investment at the expense of the Federal Reserve. Not counting these gifted shares, the Treasury assumes a break-even price of $28.73, but if we examine its investment in isolation, the true break-even is $45.53. After adjusting all cash flows associated with sale of stock, the Treasury’s profit of $5 billion becomes a loss of $12.7 billion. A recent New York Times includes a piece on the Treasury’s study of the various bailouts or “rescues” of distressed financial and other institutions. Gretchen Morgenson, Seeing Bailouts Through Rose-Colored Glasses, New York Times (May 19, 2012). The Treasury study, The Financial Crisis Response–in charts (April 13, 2012), is positive about the way that government handled the bailouts. Collectively, these programs –carried out by both a Republican and a Democratic administration–were effective in preventing the collapse of the financial system, in restarting economic growth, and in restoring access to credit and capital. They were well-designed and carefully managed. Because of this, we were able to limit the broader economic and financial damage. Although this crisis was caused by a shock larger than that which caused the Great Depression, we were able to put out the financial fires at much lower cost and with much less overall economic damage than occurred during a broad mix of financial crises over the last few decades. Reading that, one might conclude that everybody now is sitting fairly pretty, and that it was all done in a very upfront, fair and damage-free way. That ignores the fact that the bank bailouts treated the banksters with kid gloves–letting managers continue to receive their customary overcompensation and allowing banks generally to continue their predatory practices even while the taxpayers were providing them extraordinarily low-cost financing with practically no strings attached. Meanwhile, ordinary Americans–especially those in the lower half of the income distribution–suffered enormously. Congress–at the behest of the banksters–refused to enact mortgage clawback provisions in bankruptcy, the one law that would have done wonders at saving families and neighborhoods from unprecedented deterioration and blight. Now, it is good to know that at least the “direct fiscal cost” of the bailouts is likely to be positive. But note the gaping hole between that amount and the overall true cost of the bailouts–the “impact of the crisis on our fiscal position” and “the cost of the tax cuts” and “the emergency spending programs.” Now, at least the emergency spending programs generated economic activity and made real differences for individual people a good number of whom one can assume weren’t in the top 1%. The tax cuts are a big cost item and one that may well not have had the benefits assumed, except for those that went to the lower and lower-middle income working classes (such as the payroll tax relief). And the impact on our fiscal position is ongoing and still strongly felt, as we struggle to rebalance an economy that already consumed too much from outside and produced too little here at home. So how much comfort can we take from the idea that the direct fiscal cost may be significantly less than some had initially expected it to be? Here’s where the Times story comes in. Morgenson notes that “As the battles over financial regulation rage in Washington, it’s crucial that American taxpayers understand the costs associated with rescuing behemoth institutions.” We cannot take wise action for or against reduction in size of banks or other issues unless we are dealing with full information about the crisis and its aftermath. That won’t be easy in the politicized environment in which the Obama administration understandably wants to showcase how its efforts have helped the economy and the GOP seens intent on a “my way or the highway” approach to governance that cares more about winning a race than about doing what’s good for the people. Morgenson reports on an interview with Edward Kane, Boston College finance professor and economist, who thinks that the public needs to see a more thorough cost-benefit analysis of the TARP and other expenditures. Kane calls the analysis “deficient” (one might even say misleading) for counting as gains the interest income the Fed made from holding Treasuries (this is like money passed from mom to dad to put in the allowance jar for the kids–in other words, Treasury interest is paid by the US fisc to the Fed, and the Fed’s profits are paid into the US fisc, so it’s all the same pot). But the bigger deal is a genuine evaluation of the opportunity cost of the subsidy provided to bailout recipients. Note that “Main Street” here includes government expenditures — 20% of the total. Remove those, and Wall Street money flow is 58 times the size of Main Street. (FIRE is finance, insurance, and real estate.) 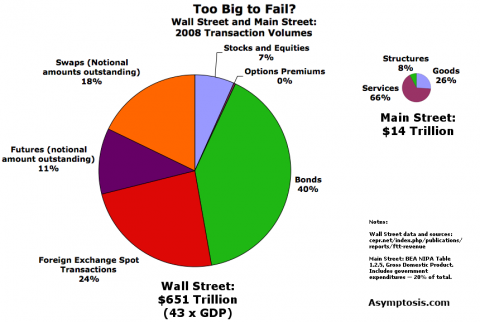 The financial industry has spent the last 30 years inflating its own bubble. The red bar on the left is the one I’m concentrating on here. 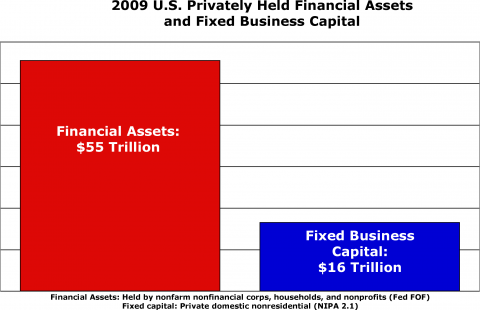 (It’s probably a big understatement, because it doesn’t include assets held by financial corporations; see “tally stick,” below.) Divvy these financial assets between every household in America, and each one gets half a million dollars. Yow. Think of that pool of financial assets as stored money. While they couldn’t all be turned into actual “money” at one time, they constitute the pool of money held by people and businesses, which money flows into (from personal savings and undistributed profits) and out of (for consumption, fixed investment, and tax-paying). This pool is also expanded by new credit/money creation, and increases in asset values. It is shrunk by loan payoffs and declines in asset values. Now here’s the key point to understand: everything of value to humans is created by the people and businesses on Main Street producing, buying, selling, and investing (in productive assets and housing). Yes, Wall Street produces and sells some of that value: vehicles for investing business and personal savings in a variety of real assets (“intermediation”), safe storage (compared to your mattress), convenience, bookkeeping, advice, etc. That’s all paid for via fees and commissions, and those Wall Street fees and commissions are counted as part of GDP (aka Main Street). As they should be. Whereas the financial sector claimed less than 15 percent of total U.S. corporate profits in the 1950s and 1960s, its share grew to 25 percent in the 1990s and 34 percent in the most recent decade through 2008. —Testimony by Sheila Bair, January 14, 2010. You don’t have to imagine “evil actors” (though there is some proportion of those on Wall Street) to understand why a massive financial sector could be really, really bad for the real economy. Imagine one of those super-hot racing sailboats that let you pump water from side to side as you switch tacks, to keep the boat upright, stiff, and stable. Now imagine all that water leaks out into the bottom of the boat, so it’s sloshing around with the wind and wave action. Every time you run into a big wave, all the water flows to the front of the boat. A big gust of wind heels you over, and all the water flows over in the same direction. It makes the boat really unstable. That water is the money swirling and sloshing around in the financial economy. In the short term, those flows are are driven largely by people trying to predict what other people are going to do, so they can go in the same direction. Sound like our sailboat? With $55 trillion of financial assets in the U.S (4 x GDP), and those assets trading hands maybe twelve times a year, that’s a lot of sloshing. It’s no wonder the sailboat gets knocked over periodically. Now imagine that a whole bunch of your best and brightest crew members are spending their time with buckets pouring more water into the boat, and moving the water around from place to place (while furiously collecting as much as they can in little bottles in their pockets). Do you think you’re gonna win the race? But here’s what’s weird: neoclassical economics basically ignores the motive effects of financial sector, treating it like a transparent, frictionless, and inert tally stick or bookkeeping system — like the bank in Monopoly. 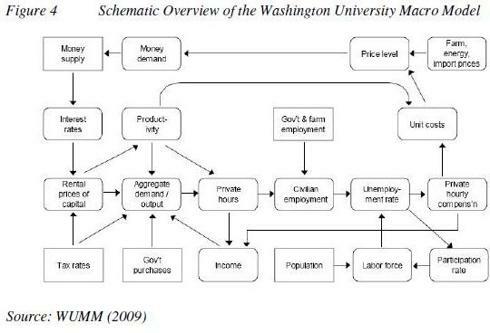 As Dirk Bezemer has pointed out, the model that the Fed uses to predict our economic future does not include the financial sector as an active entity. The boxes indicate the variables included in the model. In the present context, the important observation is that all are real-sector variables except the money supply and interest rates, the values of which are in turn fully determined by real-sector variables. In contrast to accounting models, the financial sector is thus absent (not explicitly modelled) in the model. Paper (pdf). A very nice summary here. You may take issue with Bezemer’s statements, but it’s certain that the Fed’s model does not consider the spectacularly large and highly variable flows within the financial economy, or model their effect on the real economy beyond the rather static notions of money supply and interest rates. Aside from those destabilizing money flows, which are pretty much inherent to financial economies (though their effects on the real economy depend crucially on plain old quantity), what other pernicious effects might we expect to see when a self-inflating financial sector does a very good job of inflating itself? Moral Hazard. Because the financial economy is so massive, government has no choice but to bail it out if it gets in trouble. Financial-industry players know that, and they act accordingly. rising commitments for the real sector to finance asset transaction out of wages and profit, and rising actual debt levels. When the asset was sold at a profit, someone else bought the asset at the new, higher price. He or she financed this either by diverting liquidity away from real-sector transactions, or by borrowing – at higher levels than did the first buyer. Therefore asset price booms are accompanied by rising debt and by a slowdown in real-sector nominal growth. Government Capture. Unlike welfare payments, for instance, which distribute money widely and hence are difficult to bring to bear on lobbying etc., the financial sector concentrates wealth, so it can be effectively used to capture government — which further benefits the financial sector, in a self-perpetuating cycle. Misallocation of Resources. Since the financial industry provides rewards to employees and shareholders that are well in excess of the human value it produces (even considering its role as an intermediary delivering financial capital to the real economy, and its resulting second-hand contribution to delivering things that humans value), both financial and human capital are diverted away from the real economy that produces stuff we want. I can think of several others (without even starting on things like fairness), but I’ll leave it to my gentle readers to fill out the whole set. Financial investments in business — whether in the form of equity or credit or some weird hybrid — are more like lubrication. A flow of financial capital is crucial to keep the machine running, but you don’t need all that much flow relative to output (43x? 58x??). (And Fama and French showed us long ago that it takes very few traders or trades to create an efficient market with reasonably accurate price signals.) This especially as business owners consistently tell us that investment is dead last on their list of business constraints. Too much lubrication, in fact (I’m repeating my own line here), and the shop floor starts to get very, very slippery. Truth told: we have truly oceanic quantities (both flows and stocks) of money, credit, liquidity — whatever you want to call it — far in excess of what’s necessary to lubricate the real economy. When somebody tells you that we need more savings to augment those quantities (and that we should, for instance, tax the rich less so they can provide those savings), I suggest that you go directly to Go, and look at the first three graphics in this post. If I am correct, the financial sector is much larger than is necessary to lubricate the real economy, and as a result delivers far greater downsides than are necessary to fulfill its valuable purposes. Is there anything we can do about that? Monsieur Pigou gave us the solution long ago: If you want less of something, tax it. * It amazes me that these Wall Street figures are so hard to compile, and in fact are never compiled. (Google “financial industry profits” site:wsj.com. One useless hit.) The ratio between the financial economy and the real economy is not part of the everyday language of economic discourse. A kudos to Dean Baker and the folks at CEPR for putting these Wall Street numbers together. The effect on bank balance sheets also varies with the type of recession, and a financial collapse brought about by bad loans is particularly severe. The present recession is an example of this, and policy has done a good job of preventing even worse problems from developing by rebuilding financial sector balance sheets through the bank bailout and other means. 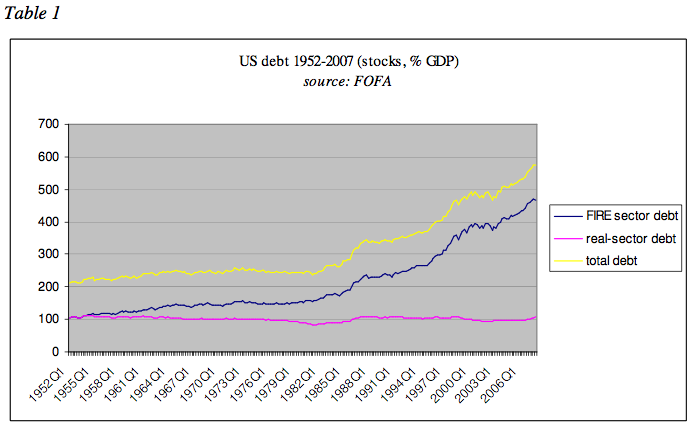 [W]e can still learn something and improve policy the next time a balance sheet recession hits the economy. Policy created and maintained as badly as it has been for the past three years must view that summary as a feature, not a bug. UPDATE: I see RDan mentioned this earlier today. Is the term “balance sheet recession” not so common as I believe it is? LA Times (via John Chait). The projected cost of the $700-billion financial bailout fund — initially feared to be a huge hit to taxpayers — continues to drop, with the nonpartisan Congressional Budget Office estimating Monday that losses would amount to just $25 billion. That’s a sharp drop from the CBO’s last estimate, in August, of a $66-billion loss for the Troubled Asset Relief Program, known as TARP. Going back to March, the budget office estimated that the program would cost taxpayers $109 billion. No one could have predicted. And no I don’t get tired of being right all the time. Rude intrusion:Ken here. For a perspective closer to mine than Robert’s, Donald Marron—who also drank the CBO kool-aid initially—looks at the wider picture of “TARP cost” here. Fortunately, he left the FRB NY before Geithner did, so it’s not a question of nepotism, just the finance perspective.